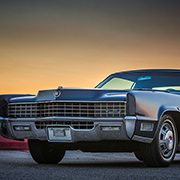 The 67 Eldorado arrived in Rotterdam | Geralds 1958 Cadillac Eldorado Seville, 1967 Cadillac Deville,1967 Cadillac Eldorado, 1971 Lincoln Continental Mark III and 1978 Cadillac Eldorado Biarritz. Last week the new Cadillac arrived in Rotterdam. In the meantime it was unloaded out of its container and the custom declaration was done. The car is now waiting in a warehouse to get picked up by the car hauler and get trucked to my home. This will be done by the end of this week. The car will then be delivered to my home in the first week of June. Cant wait to finally see it in real life. As soon as it has arrived I am going to snap a couple of pictures and upload my brand new website which will feature this new car in great detail.